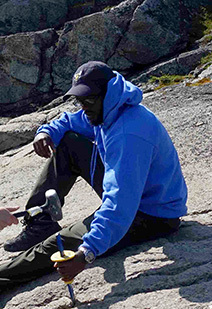 Geology major Ben Crummins ’20, left, and physics and astronomy major Frank Padgett III ’19 accompanied John Tarduno, professor and chair of earth and environmental sciences, to Labrador, Canada, this summer where the group conducted field work. The students sampled a rock known as anorthosite, which contains labradorite crystals. Labradorite crystals have the special property of refracting and reflecting light, which results in a unique iridescence.